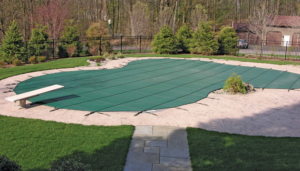 Closing your swimming pool is the most important service to get right. Letting a professional close your pool will ensure that you don’t cost yourself thousands of dollars in damage next year. Let our technicians take care of your closing and you can rest assure that next spring your pool will be ok. Want to save a little money, consider the No Cover closing and you can put your cover on yourself. At the end of every season it is important to not only check the chlorine and pH but also the total alkalinity, calcium hardness, and cyanuric acid. These do not change as quickly as chlorine and pH but if they are not in balance your pool could go GREEN! Chemistry is a very important part of the pool triangle (Pool Triangle – Flow, Filtration, Chemistry), ignoring these other values would not be wise. Putting your pool away dirty is not a good idea, leaves and dirt can cause staining or algae growth. Consider scheduling a cleaning a day or two before your closing to make sure that it is spotless when you close. If your cover is getting old or we have a very warm winter it is not a bad idea to check the pool at least one time over the winter. This is an opportunity to drain out a little water, check and balance chemicals, and make sure you will be ready for spring time.